initial thoughts: Beatus Apocalypse The first thing we noticed about this piece was its strong use of contrasting colours, such as the strong use of blue and orange in the bird. 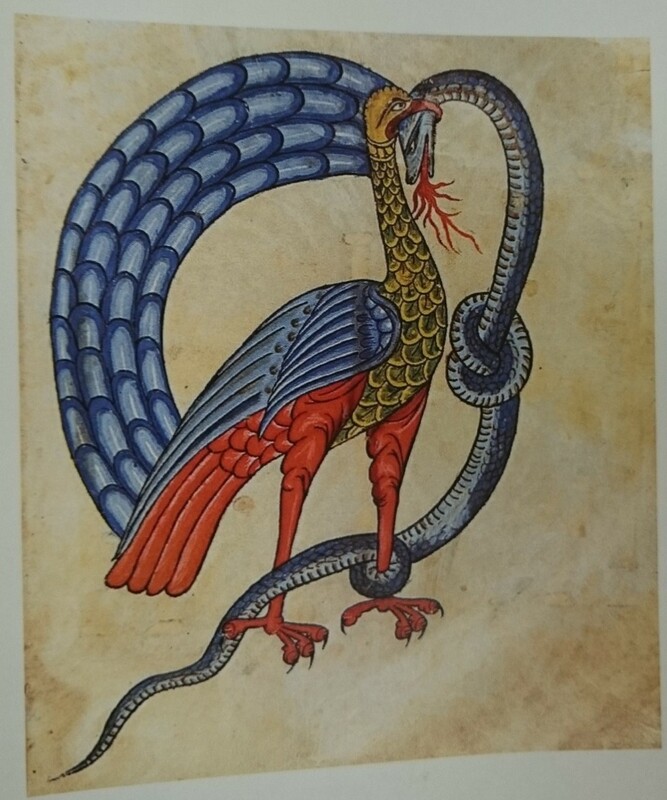 This use of colour helps with the strong lines that are present in both the bird and the snake, and helps create a sense of power to the stalemate embrace they seem to be stuck in, caused by the snake being wrapped around the bird and the bird biting the snake. The implied lines of this embrace also gives an illusion of an Ouroboros. We believe that this was probably done on a religious medieval manuscript and, as such, has something to do with god and the devil fighting. We believe this further because the fire coming from the snake’s mouth gives it an evil look, where-as the bird looks like he is almost wearing armour and has a decidedly good presence in the piece.